Driving the 2014 Lexus IS 350 all-wheel drive (AWD) on a racetrack revealed a lot about that specific car, and also the IS line of cars in general. Our most recent on-track experience with the Lexus IS 350 took place this week and it is clear that although the IS line has an excellent platform, and the 3.5 Liter V6 is more than capable on-road, anyone considering track time in an IS should choose their specific model very carefully. Torque News has been very fortunate to have so much wheel time in the new 2014 Lexus IS350. Our editor, Patrick Rall, has done a full review and his opinion was entirely positive. His story focused on the model changes from the 2013 to 2014 generations. In a recent test we had the chance to drive all the Lexus configurations of the IS 250 and the IS 350. Each can come with either rear, or all-wheel drive, and each of those can come as either “standard” or F-Sport configurations. F-Sport changes a variety of things in the car, but most important of all for track use are the wheel and tire changes. In the AWD cars, the 2014 Lexus IS 250 and IS 350 cars have the same size tires front and back. This is sensible. Anyone buying the AWD cars is going to drive in snow or they are just wasting money and gas by getting AWD. In snow, wider tires and lower profile sidewalls are not at all a good thing. So the standard tires and rims with matching rubber at all four corners is a wise move. However, the Lexus IS 350 in particular can really put to use lower profile tires on a track. Furthermore, it can also use the added grip that wider rear tires can provide. On F-Sport, rear wheel drive cars, the rear tires are wider than the fronts on the IS line. Another big difference between the AWD and rear-wheel drive (RWD) IS cars from Lexus is the transmission. In the RWD cars you get the better, 8-spped transmission with an aggressive locking torque converter. This is helpful during acceleration and more gears are usually better in all ways. What we are building up to is that the AWD Lexus without F-Sport treatment is not a bad car on the track. It is just not the best Lexus IS 350 one can opt for. It feels a little under-tired and that affects turning and braking pretty dramatically. We were surprised how much different it felt to us than F-Sports we had driven on other courses. The car definitely does not feel as if it needs more power. The 306 horsepower V6 pulls at all engine speeds and when the pedal is laid flat to the floor for long stretches the sounds from the engine and exhaust are fantastic. The 6-speed transmission is not a problem at all and the revs are now matching on downshifts in this generation IS. On the previous generation they did not match on downshifts and that was a shame. The car also has a great electronic stability control and traction control system. Either in standard or sport mode it is not in the way. You are not going to get tail-out drifts in this car, but it does not spoil the fun either. Now that we have driven the IS line in all its configurations on short and also long racetracks as well as on public roads, we remain convinced that unless you absolutely must use this car in snow, the best overall combination seems to be the IS 350 rear-drive car without F-Sport. That car will very likely come with the up-rated staggered tires from the dealer anyway, and it is the really sweet pick of the litter. If you do plan to use your IS on a track, or if you are really dedicated to on-road aggressive driving the F-Sport is worth the extra money. 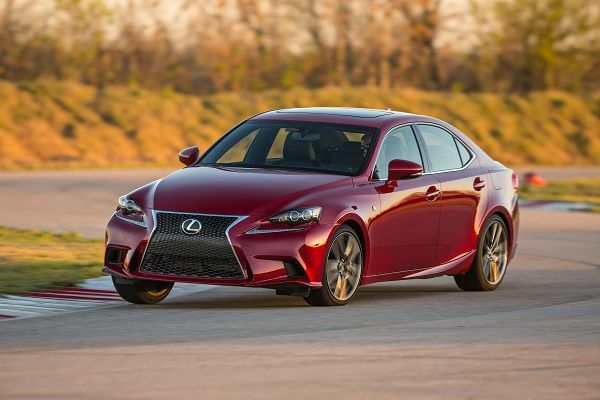 Image of 2014 Lexus IS 350 F-Sport courtesy of Lexus Media Site.